I'm often asked about using crystal grids for protection. So I've developed a protection crystal grid that can be easily used to protect you, your home, or office from negative energies. For extensive protection, you can place Black Tourmaline in each of the corners of your home (as well as on either side of any exterior doors and windows). 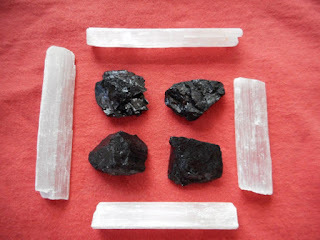 You can then place Selenite along each of the walls (energetically connecting the Tourmaline stones), between the corners and any exterior doorways or windows. The Tourmaline acts to set an energetic protective boundary, while the Selenite aids in cleansing and purification. One of the best uses of a crystal grid is for protection from psychic attack and other negative energy based attacks. A good crystal grid that has been charged can contribute a lot to keeping the home environment peaceful and safe. This applies to humans as well as to our animal friends and companions who frequently suffer from psychic attacks as well. In fact, in many cases it is the pet that takes the blows first before the rest of the family gets affected. A crystal grid is perfect energy tool to keep yourself and your loved ones safe and well and free from psychic interference. Want to balance your chakras with Crystals and Gemstones? Click here to visit our new online store.